3D Realms and Interceptor Entertainment teamed up in early 2014 to make a new Duke Nukem game, a noble aspiration that almost immediately got them sued by Gearbox Entertainment, which apparently wanted to ensure they didn't damage the value of the franchise or something. So 3DR and Interceptor did the obvious thing and made the game anyway, but with a brand new character named Shelly "Bombshell" Harrison. To be clear, when I say "brand new," I mean pretty much exactly the same: By all appearances, Bombshell is a new take on Nukem, with one of Tank Jr.'s arms. She drives a big truck with a skull painted on the hood, and her strike-a-pose weapon of choice is a monstrous three-barreled revolver named Loverboy. Somewhat more interesting on the "newness" scale is the game itself, which is not an FPS but an isometric action-RPG. 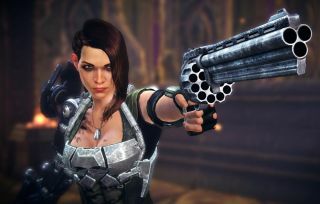 "It's a genre that allows us to blend intense storytelling action with player freedom and expression," the developers explained over at Bombshell.com. "We believe we can add something new to the genre based on our experiences as a studio. Working with a new genre and a fresh pair of eyes allows us to view things from a new perspective." Bombshell may not represent the pinnacle of character design originality, but even so I do feel some cautious optimism that it might turn out to be decent. 3D Realms may not have the industry's most sparkling post-90s reputation, but Interceptor did a nice job bringing back Rise of the Triad a couple years ago, so this one might work out too, runaway silliness and all. It's currently slated to come out later this year.